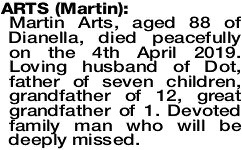 Martin Arts, aged 88 of Dianella, died peacefully on the 4th April 2019. Loving husband of Dot, father of seven children, grandfather of 12, great grandfather of 1. Devoted family man who will be deeply missed.